As a celebrity, one has to be used to these stories either true or false. Nicki Minaj falls into this category after tabloids went over drive with stories that Meek Mill and Nicki were are loggerheads. 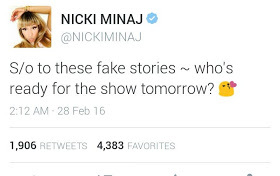 Nicki has come out respond to these reports via her twitter page and giving out a shoutout.